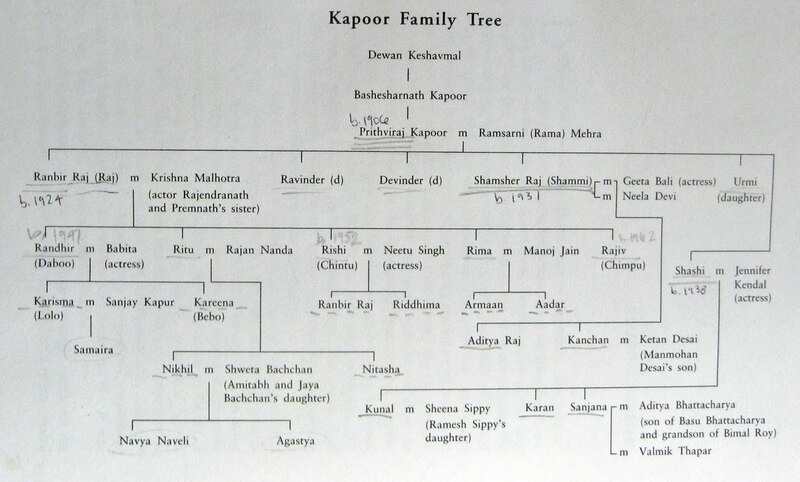 For all your Kapoor Khazana reference needs (and beyond), here is a Kapoor family tree. This image is courtesy of Madhu Jain's book The Kapoors: The First Family of Indian Cinema (Penguin Books India, 2005). Click the picture to enlarge to legible size. The dates and underlining are my own. My notations indicate who is of what generation: double underlines are for Prithviraj's children; single underlines are for their children; dashed lines for their children; etc. first and second generations: Prithviraj Kapoor (born 1906) is the father of Raj (Ranbir Raj, born 1924), Shammi (Shamsher Raj, 1931), and Shashi (Balbir Raj, 1938). Prithviraj and his wife Ramsarni (Rama) also had a daughter, Urmi (between Shammi and Shashi), and two children who died, Ravinder and Devinder. Prithviraj has a brother named Trilok Kapoor, who is a film actor too. He is best known for playing Shiva in mythologicals (with Nirupa Roy as Parvati). His son Vijay Kapoor directed a few films, and Vijay's sons Ajay and Sanjay also work in film/tv production. Raj's wife Krishna Malhotra is from a film industry family too. Her brothers Rajendra Nath, Prem Nath, and Narendra Nath are actors; Prem Nath married actress Bina Rai. Krishna's sister Uma married actor Prem Chopra. Raj's children with Krishna are Randhir ("Daboo," 1947; married Babita, who is a cousin of Sadhana and the daughter of actor Hari Shivdasani), Ritu, Rishi ("Chintu," 1952; married Neetu Singh), Rima, and Rajiv ("Chimpu," 1962). Raj's grandchildren are the most famous members of the fourth generation so far. They include Randhir and Babita's daughters Karisma ("Lolo," 1974) and Kareena ("Bebo," 1980, married to Saif Ali Khan, son of Sharmila Tagore) and Rishi and Neetu's son Ranbir (1982). Less famous but still industry-related are Ritu's son Nikhil, who married Amitabh Bachchan and Jaya Badhuri's daughter Shweta, and Rima's son Armaan Jain, who has been an assistant director for Karan Johar's Dharma Productions and acted in one of his cousin-in-law Saif Ali Khan's productions. Shammi married actress Gita Bali (maternal aunt of Yogeeta Bali, who was briefly married to Kishore Kumar before divorcing him to marry Mithun Chakraborty*). They had two children, Aditya and Kanchan (married to Ketan Desai, director of Toofan and son of director Manmohan Desai). Gita died quite young and Shammi is now married to Neela Devi. Memsaab has met Shammi and Neela and says they are delightful. Shashi married English actress Jennifer Kendal, sister of the more widely-known actress Felicity Kendal. Jennifer and Felicity spent many years in India as part of Shakespeareana, the traveling theater company led by their parents, Geoffrey and Laura Kendal. Jennifer, Felicity, and Shashi all acted in Shakespeareana at various times; this era of their lives is described in Felicity's fabulous autobiography White Cargo and loosely fictionalized in the Merchant-Ivory film Shakespeare-Wallah, in which they (and the senior Kendals) all appear. Shashi and Jennifer's children are Kunal (married to Ramesh Sippy's daughter Sheena); Karan, whom you may have seen in 80s Bombay Dyeing advertisements; and Sanjana (once married to director/actor Aditya Bhattacharya, who is the son of filmmaker Basu Bhattacharya and writer Rinki Bhattacharya, the daughter of Bimal Roy), known in her own right for running Prithvi Theater, an amazing multi-generation labor of love for the stage built by Prithviraj, Shashi, Jennifer, and herself. All of Shashi's children acted in his films when they were young and also appeared as unsuccessful leads as adults. So there you have it. Kapoors, Bachchans, Desais, and Sippys, just to name some of the closer connections. To my knowledge, Shekhar Kapur, Kunal Kapoor of Rang de Basanti, and Pankaj and Shahid Kapoor are not related to this Kapoor family. Can anyone confirm? There is currently some debate in the comments about whether Anil Kapoor is or is not related with various sources being cited. 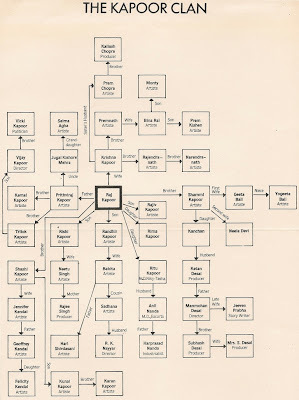 Update to post (June 3, 2011): Here is another version of the Kapoor family tree from an old Filmfare, centered around Raj. I have used it to flesh out my list above just to keep all the information in one place! Thanks to reader Asli for the scan! * I don't know about you, but this is where my brain gave out. Raj Kapoor is related to Mithun Chakraborty! Talk about masala! Excellent! Don't forget Rajiv Kapoor's unfortunate nickname "Chimpoo" ... LOL! Got it! Yeah, that's a bad one. Anil Kapoor isnt a relative.... though they are supposedly very close. Oooh excellent find, Aaren! Thanks for that! I have updated the post accordingly. Such a tiny world in filmistan, isn't it? I didn't know that Shweta had married into the Kapoor clan. The industry is so incestuous!! *confused* But the Jain book does say that Surinder Kapoor, Anil's dad is totally related to Prithviraj Kapoor. Something like first cousins. Why would Anil tell such a porky!? I am a fan of the older Kapoor generation. I love Shammi, Sashi and Rishi. Shammi was the goofiest and Sashi the sexiest in their times. Rishi was so cute. I do not particularly like the Kapoor sisters. Ranbir is not as handsome as his parents, but he sure can act. The original Kapoor boys ( Raj, Shammi, Shashi) had a fab upbringing. They toured with their father's theater group, got to hang out with the coolest actors and actresses at their movie studio and witnessed the formative years of Hindi cinema first hand. I never got the appeal of Raj Kapoor, I think he was wonderful, but compared to his flamboyant bros, he was a little boring. Kellie and Ness - I'm glad you're saying this, because it helps reassure me that I'm not crazy. That must be where I got the idea too, though it's been so long since I read the book I can't quite remember. But now that I have it in front of me.... On page 319 she refers to Anil Kapoor as "their clansman," and in the introduction on page xviii, she says "the 'other' Kapoors (Boney, Anil, and Sanjay) belong to the larger Kapoor clan from Peshawar." And apparently Tinu Anand and Prem Chopra are vaguely related too! Of course, none of this is footnoted, so who knows. I wonder if in the interview Aaren cites there is a question of what degree of relation or perhaps some terms are being used in different ways by the people involved? Who knows! 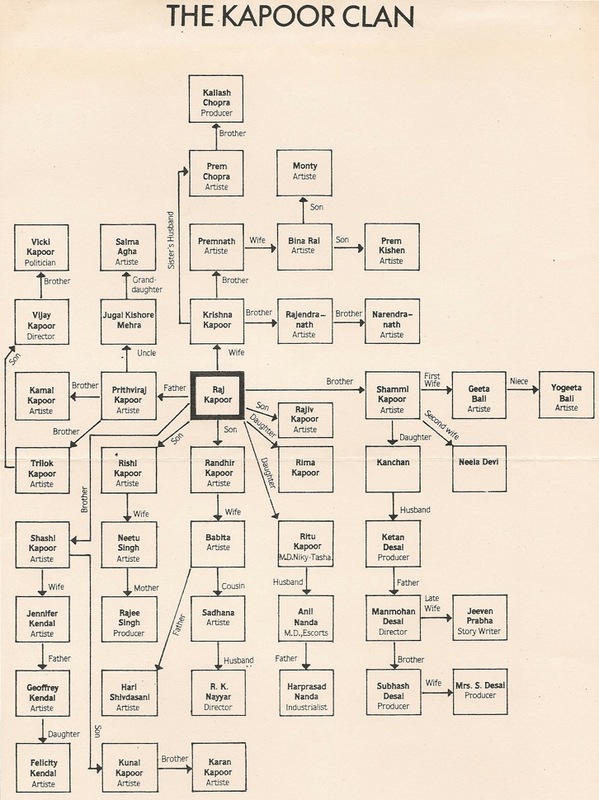 The family tree blew my mind off. One always like to believe that one knows the Kapoor family inside out. Then one sees this. True true example of a Big Indian family. Please check your in-box, I will be sending over another Kapoor family tree that shows other relatives like Prem Chopra, Salma Agha, Yogeeta Bali etc. Thanks for that, Asli - your scan led me to figure out the Krishna Kapoor branch, which is huge on its own! sunshin3girl - And the more I read, the bigger it gets! I have the Jain book, too, but I just couldn't get through it - fawning isn't even the word, more like deity worship. Wasn't there a part something like, "If a guest wanted a glass of water and no servant was handy, Raj was known to go in the kitchen and bring it himself - that's just the kind of man he was...". I don't know, I just couldn't stomach it. Briyanshu - HAHAHAHA! But that's so NOBLE! :D Yeah, it is not my favorite film book by any means, mostly because it lacks analysis and critical thought about the impact of the Kapoors, but the subject matter made it worth it for me. 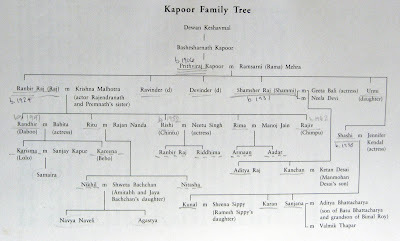 Hi, I'm just catching up with all the Kapoor posts on various blogs, and I really appreciate the detailed family tree you have here. I knew the main players and their relationships before, but something just struck me as I read the dates for each person. To wit: "Prithvi Raj Kapoor (born 1906) is the father of Raj Kapoor (born 1924) Whoa! Prithviraj had his first son when he was 18??!!! Amazing! And Raj Kapoor had his first child (according to your dates) when he was 23. So I guess there was a little progress on not getting them married too young! I never knew this tidbit, and find it quite fascinating. Anil Kapoor's father Surinder Kapoor was Nargis's secretary. And, since Nargis was close to Raj Kapoor, Surinder and Anil also naturally grew closer to Raj. Anil Kapoor family isn't related to these Kapoors. Aditi - Ahhhh! That would explain the confusing quotes that imply close connections but also deny actual relation! Thank you for this clarification. Beth, Shekhar Kapoor is Dev Anand's nephew (his sister's son); from what I've read, Anil Kapoor's father was some sort of second cousin to RK - certainly, Anil never claimed any Kapoor connection during his days of struggle. anon - If you scroll through all the comments you will see that there is debate about the Anil Kapoor connection, I believe with more people weighing in that he is not related by blood but has some professional connection through a relative. I do not know about Shahid and Pankaj Kapoor, though I have never read anything that says they are related to "the" Kapoors. Beth, please looks at this site, hope it help, i was too confused like you but then, need a long time search to find out. I am sorry to break many a bubble, but when I asked Daboo (Randhir) Kapoor - during the days when Boney and Anil were trying to revive their father's banner, and stories were floating in the press about them being related to THE Kapoors - whether they were indeed related, Daboo said, "Yes - via satellite!" So, there goes! also, Shekhar Kapur's mom was Dev Anand/Chetan/Goldie's sister, not Raj Kapoor's. Ramesh sippy is Brother-In-Law of Jeetendra. Shahid Kapoor is not at all related to Kapoor family. Several years, over couple of decades,ago, there was a film magazine article where Boney Kapoor talked about his feeling small when attending parties or family gatherings at Kapoor family homes, and Rishi Kapoor responded by saying he should have sorted family matters directly rather than with public interview. Later in a Karan Johar tv show, Rima said none of her brothers except Anil was crying at her wedding goodbye moment. Evidently there is a relationship, very clear even in looks, but now there is silence due to various members sharing screen and fearing public reaction. Surendra Kapoor was born a few days after RK, both in Peshawar, they might have been second cousins if not first.